When I worked out through my pregnancy it turned to “Enjoy it while you can! There’s no way you will be able to do that when the baby comes.” I can’t count the number of times I was told that I had unrealistic expectations, and that there was no way to “fit a baby” into my lifestyle. Sometimes you will have enough time to workout, but you won’t because you just want to look at your baby. That’s okay. Your baby is going to grow faster than you can believe. Savor it. If you miss a workout to stare at your baby it’s still time well spent. Just don’t miss all of your workouts. Time for your health is important too. 2. Short Workouts will save your fitness life. Seriously, one round of a 12-15 minute workout might be all I get in. 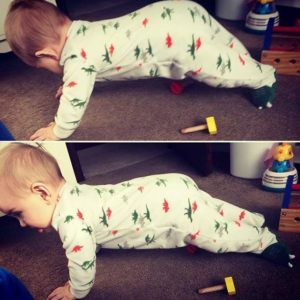 Go hard during your quick workouts, or incorporate exercises into your playtime with the baby. You can keep a “nursery workout list” on a chalkboard or dry erase board, or even make a list on your phone. Aim to get in those exercises throughout the day as you play with your little one. Or incorporate your baby into your workout. They think it’s fun! 3. If someone offers to watch the baby while you go on a run or get in a workout, take them up on the offer. It will be amazing. Not that you mind running with the stroller. That has it’s own appeal, but it’s nice to just have some alone time where you can focus exclusively on the task at hand. Focusing on your exercises as you do them actually improves the physical benefits you are getting from the exercises. 4. Showering after your workout MUST be calculated into your available workout time. Miscalculate and you will be sweaty and gross for an indefinite time period. 5. When you are into fitness people will be a lot harsher/more vocal with their expectations of your weight loss. Don’t worry about it. Focus on yourself and your baby. Re-create a consistent workout habit and healthy diet, and it will happen. For both yourself and your baby it’s more important to create a healthy lifestyle and body image than it is to starve your way to an arbitrary number on the scale. 6. Your hair might fall out. It might be more mentally traumatic for you than the weight gain and body changes (it was for me!) I expected to gain weight, and knew it would take time to re-build my strength. I didn’t expect to lose handfuls of hair. That was harder on my self image than the weight gain. For you it might be the opposite. You will be okay though. We don’t have to be perfect (mentally, physically, or as parents). All we can do is our best. If someone makes the “mom haircut” comment just brush it off. 7. The first time you work out after having a baby it will be weird. You’ve been pumped for this day for six weeks (or however long your doctor restricted your exercise), but things that used to be easy will be hard. Even if you worked out your whole pregnancy. Enjoy the chance to re-build and track your changes. If you can only do 5 pushups to start, track how long it takes you to get to 20-consecutive pushups again. Small goals, and recognizing your progress will help you feel happy and confident with your changes, instead of falling into the cycle of comparisons to what you used to be able to do. 8. There will be times when you try like crazy to get your workout in, and it will not happen. The baby has other plans. That’s okay. Don’t beat yourself up if you miss a workout. 9. BE READY. If you want to get in your workout, dress for it. Don’t wait until the baby is napping to change. Once the baby is napping, or your significant other is taking care of the baby, jump into the workout. With babies your plans can change on a dime. Be ready to go when you have the opportunity. 10. Ask for help. This is a hard one for me. I’m a self-sufficient doer. It literally does not occur to me to ask for help most of the time. I don’t like making people feel obligated to do something that I feel I should be able to take care of myself. As a result, people don’t often offer to help. If you need something ask. You may be pleasantly surprised to find that many people are willing to help. 11. Focus on Intensity. Your workouts may be shorter, but that doesn’t mean they have to be less effective. Aim for shorter, full body workouts where you push with more intensity. Great results, less workout time. 12. Isn’t this supposed to be a list of 11? Consider this a bonus tip for the nursing mamas! If you are nursing make sure to stay hydrated and well nourished to help prevent your supply from decreasing. Drink fluids with electrolytes. Normally I only like water, but I have added in gatorade or other electrolyte drinks on hard workout days and I have had no decrease in milk supply. Do you have anything to add to this list? Comment below! Great list! I’m trying to stay active with Baby #2 and. I’m lucky that my husband helps out to give me time to get my workouts in. I’m closing the baby factory after this one, so I can’t wait to get back into your regular HIIT and strength workouts in a few months! The fact that you learned all of this after your first child tells me you are a wise woman;) if it’s important to you, you will make exercise a priority. It may not be everyday, but as long as you fail forward you will succeed. Thank ypu for sharing your tips and for your honesty and transparency. Both are great qualities to possess. You are one AMAZING woman! Thank you for always encouraging us and telling us it’s ok to be “human,” too! Love your commitment to health! Keep it up! Our bodies do strange things to us and part of it is out of our control. We get hungry, we get crampy, we get bloated, we get TIRED! I think your dedication to living fit is amazing and I think you’ve got this! I also suffered hairloss and it does come back! It takes time. You’re such a beautiful person. Thank you for starting your blog and for sharing your experiences with us! Such great advise! Momma of 6 here with my last being a week older than maverick! I’ve done nothing but running (mostly treadmill) and your workouts and 9 months later I look and feel awesome! My oldest is only 11 so my kids have all been super close in age. I try to workout 5 days a week usually just 30-45 min. Your HIIT workouts are awesome! Thanks for all you do! but I just do. I love your workouts and your motivation to all of us. Your son is growing up so fast. He is so cute. Thanks for letting us know its ok to be “human” and not to be hard on ourselves. I was wondering if you were nursing. 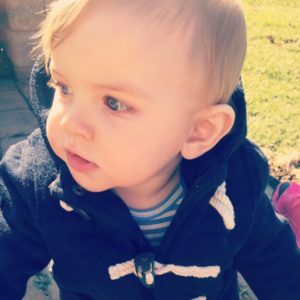 Any other tips for the nursing mama? How it affected supplementation? Also- what kind of running stroller did you use that you could run with Maverick at such a young age? Such good advice. I’m not pregnant and never have been, lol! BUT I enjoy these reads and store it away for when I am. Thanks! I like that you stress quick workouts & high intensity. It’s great to know you don’t have to put in an hour+ workout at the gym for it to be effective! Thanks Melissa! I’m so happy for you and have loved following your fitness journey into motherhood. we love you Melissa. My son always tells me- sometimes ask- it’s time to do Melissa.! Lol. I worked out to you through my second pregnancy til the day I gave birth -12 weeks postpartum now and I felt great. Buuut I shall not tell a lie. I have a body that doesn’t let go of all of the weight when I’m breastfeeding. I eat clean and workout regularly… still just doesn’t wanna let it go. I nursed my son til my daughter was born so I still had 10lbs I couldn’t get rid of. And now I have 15 from this pregnancy that won’t budge either. So 25 lbs out and I’m still working out and eat clean, but because it makes me feel good even though I can’t see any results. I keep on keeping on. Thanks for your workouts. With two 15-20 minutes is all I can squeeze and I challenge myself 30 days at a time. Just do 15-20 mins. Whatever you can even if it’s a quick walk with the dog and two kids in tow. So thanks for all the encouragement you’re awesome!!! Love this! And true way beyond the time you have a newborn! It’s all about keeping your priorities simple. Family, health, and work. I love your workouts and look forward to them each day. 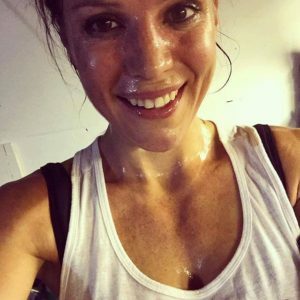 I am a runner (5K most days) and I have added your workouts as a supplement for a little over a year. I feel stronger overall and more complete. It helps me accomplish my priorities. Thank you, Melissa and Jesse! Keep it up! Thank you for this!! I am one week overdue with my first baby, I have tried my best to maintain fitness throughout my pregnancy, and I have consistently been working out until about 38-39 weeks (although very low intensity at the end) I have been concerned with how I am going to manage to ‘bounce back’, and fit in fitness/work etc. One point that I would like to add that I have experienced, is the comments from people that you will ‘be all baby’ and ‘you’ll bounce back straight away’. While it’s lovely that people are encouraging of maintaining fitness, it put undue pressure on me to not put on excess weight, and increased the pressure to jump straight back into it once the baby is born because other people expect me to be straight back in my pre baby jeans. While I am bursting at the seams to get back into fitness, this is a time that needs to be taken for my body to heal and to bond with my baby. I have kept track of your post partum journey which ironically has been my entire pregnancy, and your attitude has definitely set me up for a balanced recovery. Thank you, and I cannot wait to start your workouts again! I never thought Id be jealous of a burpee challenge!! I had 2 babies 12 months apart 🙂 for 2 years there – there wasn’t much time for anything but your site has given me access to super short and intense workouts (I super hate cardio burts). It’s great to work in 15 min …..or 10 because once my 4 year old and 3 year old discover I’m exercising, they insist they need the mat to do “loga” (yoga). So yeah I’m not where I want to be, but I feel I’m at a better fitness level than ever before…. 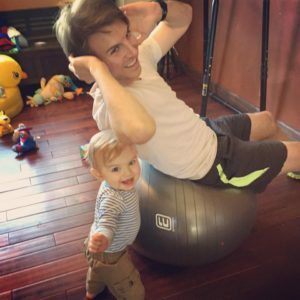 and bonus points for Melissa – my kids usually try to follow along the videos if they gatecrash my workout. Making positive impacts on 2 generations. Can’t beat that! I have a energetic 2.5 year old and a 7 month old special needs baby (she has a G-tube and Down syndrome.) I also work full time. Sometimes the baby wakes up during my HIIT workout and I have to stop and go soothe her, then resume my workout. My 2.5 year old likes to bring in toys and put them on my mat during the workout. One day, she brought her potty and proceeded to do #2 in it. I had to smell it for the rest of the workout, but I didn’t stop! I also have a cat that likes to lay on my sandbag during workouts as well. On weekends, I take my older daughter on runs in the jogging stroller while my husband watches the baby. If one really wants to do something, one can find a way whatever it may be…working out, cooking, cleaning, etc. Thanks for sharing all your amazing workouts, I have been a follower for several years. HIIT workouts have gotten me in better shape than running for an hour or doing long weight workouts.